While I understand where adoptive parents are coming from when they say this, I can’t help but see a problem with this kind of statement. Anyone who’s followed my writing long enough knows how much value I put on “birth culture” and why. Its significance goes far beyond just “knowing where you came from”. How exactly does one base aspects of one’s identity on some spot on the map and a few holidays? There will always be some adoptees who say that it’s important and some who will say they simply don’t care. That is the right of each individual and that’s the clincher. Since each child is an individual, how exactly can anyone predict who will and who will not value their birth culture and to what degree? The problem is no one can predict this but it shouldn’t be used as an excuse to just forget the whole thing. Hopefully we are past the days when adoptive parents naively assume that they are getting a “blank slate”. There is enough out there to at least begin the process of informing and educating themselves on the complexities that come with adoption. However, it takes a willingness to listen and try to understand. The fact that I’m still seeing statements like this is not a good sign. When I come across comments like the one above, I feel like someone has just dumped a bowl of jello down my pants. I have to resist the urge to jump up and down while running from the room. From the day they bring these children home, adoptive parents begin imposing their culture on the child. This comes in the form of nursery rhymes, lullabies, fairy tales, television, food, language and religion. Why is it a problem “force-feeding” a child their own culture yet it’s perfectly okay to impose their own? I was dragged to church on Sundays where I was the only person of color and made to sit in American History classes so I could learn the American side of the Vietnam war. Why was it perfectly okay to “shove” someone else’s culture down my throat while depriving me of my own? I don’t think it was a malicious act on the part of my parents, but that is what was being done. Firstly, I’ve not heard anyone suggest that a child’s birth culture be “shoved down their throat”. I would have thrown a fit if my parents had made me wear an ao dai and paraded me around like some freak. I was already in a environment where I stood out and would have resented having that further emphasized. That, in my opinion, was a large part of the problem. I was in an environment that was NOT well suited for offering and making me feel comfortable with learning about Vietnamese culture. The fact that an adoptive parent would even think of it as “force feeding” is a sad statement in itself because it illustrates the amount of loss. What that says to me is that a child’s birth culture no longer belongs to the child. It’s now held “in trust” by the adoptive parent to do with as they please. Also, I think one has to realize that a child’s “birth culture” doesn’t necessarily end with that of their birth country. As for myself, I seem to be undergoing a kind of backwards migration. I look to Vietnam as my “birth culture” but must find some way to consolidate it with my current self. That is when I must “return” and focus on the Vietnamese American community. They have already begun the process of striking the balance between their two identities. The fact that I use “they” and not “we” should tell you something. Even though technically I’m a 1st generation Vietnamese American, I would be much more successful trying to fit myself between 2nd and 3rd generation Vietnamese Americans than I would among those of the 1st. My children would probably fit somewhere between 2nd and 3rd or 4th. Yes, I understand that each family and each individual will differ depending on experiences and personalities. Looking to the Vietnamese American community doesn’t provide a perfect model, but it’s the best I have to work with. Nothing will ever fully compensate for the loss of my birth culture nor will I ever truly “fit in” but I refuse to walk away empty-handed and starving. VietNamNet Bridge – “Mr. and Mrs. Smith” have sent documents to the Immigration and Naturalization Services for the adoption of a boy at Tam Binh Orphanage (HCM city) which the couple visited in November, 2006. Angelina and Brad want to adopt a child at 3 or 4 years of age. There are many procedures the couple must go through before being able to take the child home. Contacting the American INS is just the first step. Mr. Vu Duc Long, head of the Bureau of International Adopted Children (the Ministry of Justice), said that the famous Hollywood lovebirds had started the adoption process in the U.S and hadn’t contacted responsible authorities in Vietnam. And Mr. Nguyen Van Trung, director of Tam Binh Orphanage, said that he was waiting for any direction from the Ministry of Justice as well as HCM city Department of Justice. Ms. Jolie used to say that she wanted to have a multi-racial family. She has a 5-year old Cambodian child named Maddox, and a 2-year old Ethiopian one called Zahara. And the 9-month old Shiloh has both the American and Namibian citizenships. Don’t get me wrong. I think the humanitarian work she’s doing is great but why is it she feels the need to take home a souvenir? NEW YORK — A documentary entitled The Last Ghost of War which depicts Vietnamese Agent Orange (AO) victims’ lawsuit against American chemical producers, is scheduled to be screened in the US, in late February. Pham Quoc Thai, an overseas Vietnamese, who worked on the Janet Gardner directed 57-minute piece, said that the documentary focuses on the three groups of people exposed to Agent Orange, Vietnamese victims, American war veterans and ex-workers at US chemical factories. War veterans, lawyers and historians in both Viet Nam and the US would also appear in the documentary to help provide a thorough insight into the use of the defoliant used by the US military during the Viet Nam war, Thai said. Thai emphasised that through the film, which would be screened before the US Federal Court of Appeal at mid-year, the producers highlighted the fact that all AO victims regardless of nationality, require justice as well as compensation. The Last Ghost of War will make its debut at Rutger University in New Jersey on February 24, and will then be screened at Rider University in late March and Princeton University during April. In the interview, Michelle said that it was an adoption agency that handled Operation Babylift (possibly by Holt) to which I replied, “Yes, I believe so.” Operation Babylift was actually a directive initiated by President Gerald Ford though Holt and other organizations did participate. I take responsibility for the inaccuracy because I should have said, “I’m not sure,” when she asked for confirmation. Ugh, I’m a nitpicker and this one bugged me. If anyone noticed any factual inaccuracies, please let me know. The kids and I came home last night after attending a Chinese New Year celebration. After getting everyone settled in, I sat down to listen to my interview with The Adoption Show. As I mentioned, I felt I could have done a better job but am satisfied with it as a first-time interview. I have to thank Michelle for the opportunity, because it was a learning experience and something I swore I’d never do. I’ve mentioned before that public speaking of any kind terrifies me, but there I was…speaking publicly. As I was listening to Betty Jean Lifton speak and nodding my head, she mentioned something about “a ghost mom”. 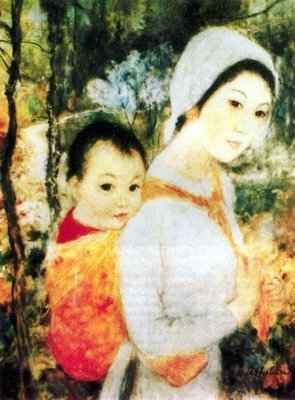 Lately, I’ve been thinking about and writing a lot about my Vietnamese mother. In a way, I’ve also begun an inner dialogue with her through my poems and essays. They’re conversations with her that I felt I should have had but never could. I started re-reading some of my writing and noticed that I was doing a large amount of explaining and apologizing. If I look deeply, I know it’s because I feel she’s been the victim of an injustice and that I’ve contributed to it. Heh, does adoptee guilt ever end? She’s the one without a voice. Others are speaking for and about her (or not), but her story has been denied. I’ve come to hate the term “birth mom” even though I slip and use it out of habit or when I need to distinguish between an adoptive mother and a “genetically linked” mother. I feel guilty thinking of my Vietnamese mother as anything but Má. It’s my way of giving her back “her name” and putting her back in “her rightful place”. Basically, I’m re-writing her into my existence in the only way I can. Chúc mừng năm mới, Má. Come and feast with your flesh and paper daughter on what has become your *ngày gió. Forgive me. It’s taken 37 years for me to light the incense and invite you in. 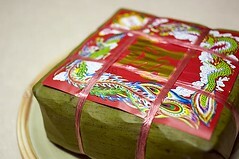 …or Chúc mừng năm mới. Wishing all of you a happy new year! Whoohoo! This year there are two celebrations in our area, so the kids and I will be attending one or both tomorrow. Ironically, tomorrow also marks my first audio interview. I’ll be a guest on The Adoption Show hosted by Michelle Edmunds.